The United States Congress designated the Tamarac Wilderness (map) in 1976 and it now has a total of 2,180 acres. All of this wilderness is located in Minnesota and is managed by the Fish and Wildlife Service. There is a special feeling of wildness about this place, Tamarac, best expressed by the eerie howl of a wolf, mournful wail of a loon, or the drumming of a ruffed grouse from deep within the forest. 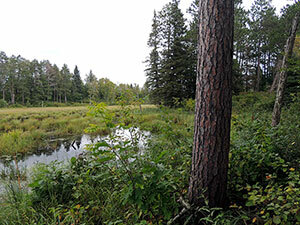 Tamarac Wilderness is located within the Tamarac National Wildlife Refuge in the glacial lake country of northwestern Minnesota. It was established as a refuge breeding ground for migratory birds and other wildlife. Tamarac is a land of rolling forested hills interspersed with lakes, rivers, marshes, bogs and shrub swamps. The token of the Wilderness is the Tamarack tree. This unusual tree is a deciduous conifer, turning brilliant gold before losing its needles each fall. Tamarac’s Wilderness consists of four sections within the refuge: three islands in Tamarac Lake and a larger section in the northwest corner. Here you will find stands of mature white pines, a favorite nesting tree of bald eagles. Historically, the area was a prized hunting, fishing, ricing and maple sugaring area for Native American tribes. The Sioux once controlled the area followed by the Ojibwe. Today the northern half of the refuge lies within the original White Earth Indian Reservation established in 1867. Tribal members continue to hunt, fish, trap and harvest herbs, berries and wild rice in the Wilderness and refuge. Tamarac lies in the heart of one of the most diverse transition zones in North America, where northern hardwood, coniferous forests and the tall grass prairie converge. This diversity of habitat brings with it a wealth of wildlife. There are over 250 species of birds and 50 species of mammals. Spring on the area attracts a magnificent warbler migration and fall is highlighted with an abundance of waterfowl including more than 15,000 ring-necked ducks at its peak. Bald eagles are common and wolves are occasionally seen. Tamarac is one of the premier production areas for trumpeter swans in the lower 48 states. Tamarac Wilderness also provides critical nesting habitat for golden-winged warblers, a Species of Concern whose population has declined steadily over the past 35 years due to loss of habitat. Other wildlife include black bear, porcupine, mink, fisher, otter and beaver. With the brilliant fall colors of aspen, maple, oak, birch and tamarack interspersed with evergreens, Autumn truly is a beautiful time to experience the Tamarac. The Wilderness does not have established hiking trails. Planning to Visit the Tamarac Wilderness? How to follow the seven standard Leave No Trace principles differs in different parts of the country (desert vs. Rocky Mountains). Click on any of the principles listed below to learn more about how they apply in the Tamarac Wilderness.